Our private one day and half-day floating market tours let you hop on a long-tail boat to taste, shop and discover the local life along the canals. Our lovely Local Experts will make sure you experience the best of food and learn insights about Thai culture at your own pace. 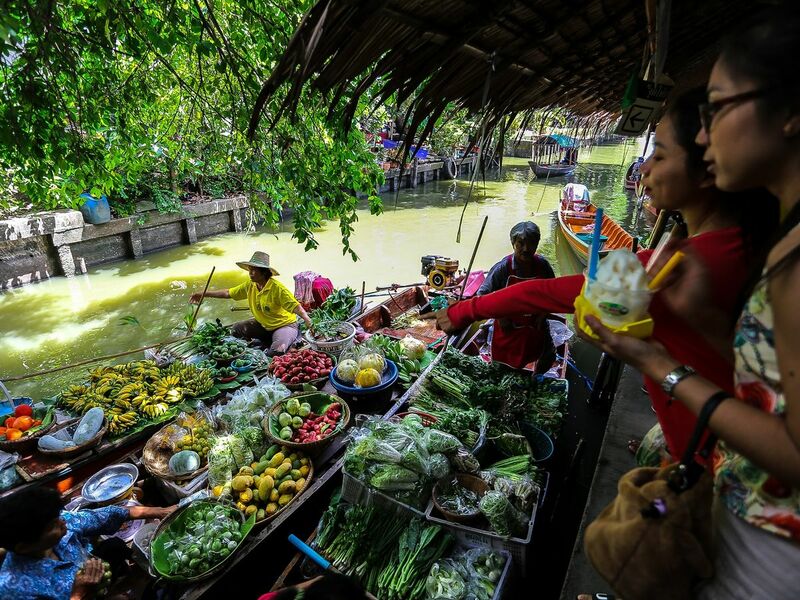 It is no doubt among the most well-known floating markets in Thailand. Its unique buzz plus a wide range of local goodies make an ideal cinematic background - and Damnoen Saduak was featured in many films. Even though Damnoen Saduak has adapted itself to the modern era, its old-school charms are still a big draw to both travelers and locals. You will find fresh produce, local Thai snacks and handmade souvenirs for friends at home here. When: 8 a.m - 1 p.m.
is very unique because besides food, it is home to heaps of fireflies! Our perfect evening here always starts with the neverending food-hopping, then a boat tour to see the twinkling bugs and local life along the dimly lit canal. Whether you are a foodie, a nature lover, a fan of cute craftwork - or all three combined like we are, Amphawa has everything you need, and more. Hint - we got our quirky tee shirt with firefly prints here and we love it! As you’ll be riding for a few hours to get here, we recommend making it more worthwhile. Start your day early and visit the Maeklong Railway Market first. See how the vendors sell their produce right along the railway, then wait for the iconic shot - when the train approaches the platform! When: Friday-Sunday and public holidays from 3 - 9 p.m.
is close to Amphawa floating market but offers quite a different experience. If you have aversion to crowd and are keen to see how the real local way of life is, Tha Kha might suit you better. The vendors live around the area and mostly sell homegrown fruits and local food, so you won’t really find many chic cafes or sleak handmade souvenirs. Visit Tha Kha Floating Market and Maeklong Railway Market with our Local Expert here. When: Weekends only from 6 a.m. - noon. is not far from Ayutthaya Historical Park. Although it’s not as fancy as other larger floating markets, Ayothaya is a great stop for local lunch before you continue exploring the Ayutthaya Temples. Our favorite thing about the place is that we can find rare top-notch Thai desserts like Thong Muan Sod (Thai soft rolled wafer with coconut). If you're looking for some green space to escape Bangkok's buzz and a vibrant local floating market, Bang Nam Phueng might be perfect for you. Spoil your taste buds with delicious Thai food then take a bike tour in Bang Kra Chao - an awesome way to breathe in the pure air and burn some calories! Floating markets in Bangkok - You might want to visit one of the floating markets in Bangkok if you are looking to save a bit of time and money. Then you can cover a couple more places, or finish your trip early and head to the airport in time. is one of the most authentic and local floating markets in Bangkok. We love food scouting here, and the laid-out ambiance of the place makes it our go-to floating market. It’s important to note that as this is where locals shop, you won’t find artsy handmade gifts, but a bunch of delicious Thai food and some cute cactus shops. Visit a local temple and ride along the small canal with our lovely Local Expert here. When: Weekends only from 8 a.m. - 5 p.m.
is another authentically local floating market in Bangkok. It’s safe to say you won’t likely come across another traveler while food scouting there. Let our lovely Local Experts tell you about the charms of the local way of life, or learn to make your very own Pad Thai with a Thai grandmother - a true food guru! When: Weekends only from 8 a.m. - 3 p.m.
lets you give alms to the monks who come by old-school boat! For our Thai grandparents, the scene brings back the good old days. For us locals and you travelers, it lets us peek into the charming past - when most of daily happenings in Thailand had a lot to do with the tide. When: Weekends only from 6 a.m. - 6 p.m.
Alm giving is at 7.30 - 8 a.m.
Let our Local Experts take you to the truly local floating markets by a private car, enjoy authentic Thai food and explore what it means to live alongside canals in Thailand. From one day and half-day floating market tours with lots of local activities, our Local Experts have come up with various travel ideas for your authentically local and hassle-free trip.